Local lemon trees are groaning under the abundance of fruit and everybody knows that I love lemons so my kitchen is overflowing too! I do nothing fancy when preserving, I just want to capture the clean flavour and conserve the nutrients of these beautiful fruit. Freezing the juice and the rind and preserving the whole fruit in salt ensures you will have a ready supply when lemons are scarce. The rind freezes really well and the integrity of the essential oils is retained. However you have to remember to zest the lemons before squeezing them, several times I have juiced the lemons and only then realised that I have not zested them first!! If you make this mistake too, cut the skins into fine strips and freeze or add them to your salt preserved lemons. When I freeze the rinds I simply arrange them in a thin layer on a little baking paper on a tray in the freezer. When it has frozen I break up the “sheet” of rind and store in containers in the freezer. I also like to ensure there is lots of pith being removed with the rind as this is high in tissue strengthening bioflavoids. Freezing the rind preserves the oils that give lemons their cleansing aroma and therapeutic properties such as easing stomach acidity and other compounds that function as antioxidants. I freeze the juice in two sizes of ice cube trays, a larger one to use in cooking and a smaller one to use in my morning lemon water. When the juice has frozen I simply unmould and pop the cubes into a container and store them in the freezer for future use. The juice is particularly high in vitamin C and has a tonic, alkalising, antioxidant effect in the body. Preserving lemons in salt has been done by many cultures over the ages. They are heavily used in Moroccan and North African cuisine to which they impart their distinct flavour. Again, when preserving the lemons with salt I keep it simple so I can use them in many different styles of cooking – cold and hot preparations. For me a cinnamon stick and a bay leaf suffice however there are many recipes from many cultures for herb and spice variations. Preserving them in this manner also introduces some probiotics through the fermentation process as well retaining the bulk of the antioxidants and therapeutic benefits of the oils in the skin. They are so easy to make, you just have to wait a month to six weeks for them to be ready! 1. Cut the lemons into quarters length ways. 2. Pack the lemon pieces snugly into the jar sprinkling salt between the layers. 3. 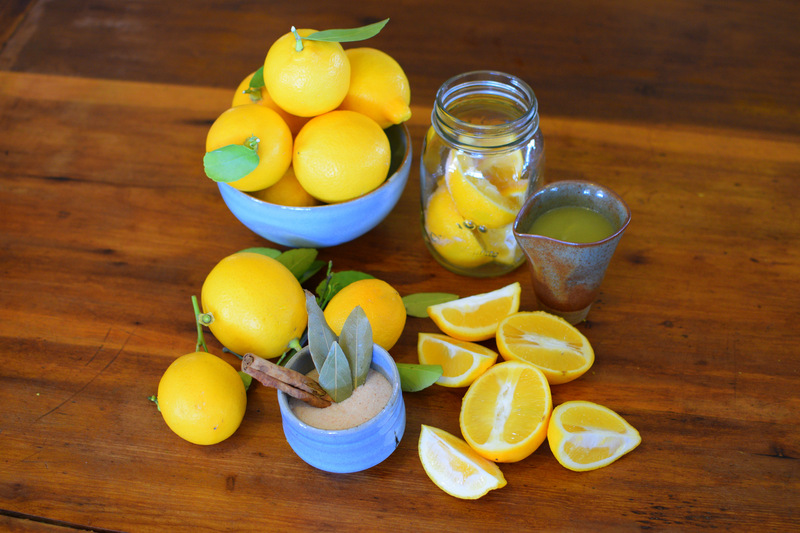 Slide the cinnamon stick and bay leaves down the side of the jar between the lemons and the glass. 4. Top the jar up with the additional lemon juice ensuring the lemon peices are submerged below the level of the the juice. 5. Keep the lemons on the kitchen bench for about a week shaking the jar daily to ensure the salt breaks down. If any of the lemon pieces pop up above the juice, open the jar and push them back down with a clean utensil. 6. After about a week tranfer them to a cool dark place or into the fridge. After four to five weeks they will be ready and then best consumed within six months. Depending on the type of lemon you are preserving you may not need to add any juice or very littlle. The last batch I preserved I needed no extra juice, the lemons were so juicy that by the time I had squished them into the jars there was ample juice to cover the lemons. 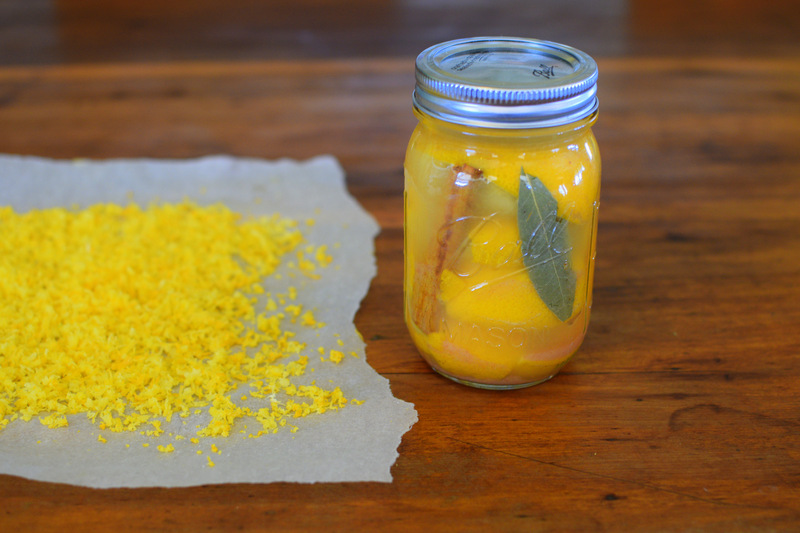 You will find that once you have mastered the art of salt preserved lemons that you will no longer need the recipe. You will be able to “guesstimate” the amounts and have a big stash of these wonderful things for the months ahead. Thanks Kaye! There are some lovely ceramics in the photos too! !